The second car of our F1 Historic project is released. The McLaren MP4/8 was a Formula One racing car which competed in the 1993 season. It raced in all sixteen Grands Prix, scoring five wins. The engine was a Ford HBD7 3.5 V8. The car was designed by Neil Oatley around advanced racecar technology, including a semi-automatic transmission, active suspension and traction control systems. There are currently no setups for F1 Historic McLaren MP4 8. Add a Setup. 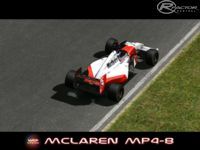 There are currently no car skins available for F1 Historic McLaren MP4 8. If you are a painter you can share skins for this mod via the Car Skins area. Visit the Spray Booth for painting tips & tricks. How do I download basemod/ get cars to work in game? 192.168.l.254to Slow for his support, his advice and testing throughout its development. Man, The mod F1 Historic McLaren MP4 8 is lefting the rfm files and because for this, the car doesn't work in rFactor, please correct this! you first have to install the f1 basemod, then you have to install the mclaren and everything should work. Any chance of the next version of this fabulous car having the Lamborghini 3512 V12? From what both Senna and Hakkinen said, the McLambo was an absolute weapon. By far the best car I have driven in this game! First of all i think this mod by WCP is quite interesting, because it has a mix of very good cars, even those, like the 95 Ligier, that never won a GP. But most of all because every car has it's historical relevance: the Ferrari F310, for instance, was the first F1 Ferrari to be driven by Michael Schumacher and to use the new 3.0L V10 engine; The McLaren MP4-8 was the car in wich Ayrton Senna achieved his final GP win and the last he drove for McLaren before moving to Williams, for wich team he raced only on three GP's, one of them the last of his life; The Williams-Renault FW-15C was arguably the most advanced F1 car that ever raced, but also the one in wich Alain Prost raced for the last time before retiring, winning his 4th World Drivers Championship.